Dry Battery Fence Energiser that use 6v or 9v batteries to supply power. 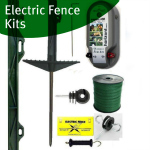 Dry battery electric fence energisers using non-rechargable batteries that are usually contained within the energiser unit itself. These fence energisers are very easily transportable so great for strip grazing or temporary fencing. 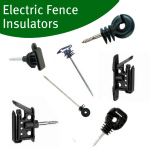 They give you the option of an all-in-one electric fence energiser. In terms of these types of energiser we stock two brands, Rutland Electric Fencing and Horizont. 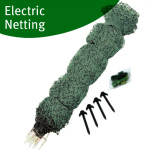 Both offer two year guarantee for their electric fence energisers as standard. The range of dry battery energisers we stock offers you a choice on the power you need although generally they are designed for shorter distance electric fences. The Horizont Equistop B1 is designed for strip grazing with horses, 9v batteries are available to sit inside the energiser. 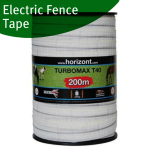 The Rutland ESB15 and ESB25 are for use in shorter fences for horses, cattle and sheep. The Horizont Farmer A1000 is a more powerful energiser that also has a 12v option and can be used on longer distance electric fences. Electric fence energisers that are powered by dry batteries are designed for their convenience. These 6v and 9v battery energiser units can be moved and placed where you need them with the minimum of work. The batteries with these types of fencer units are non-rechargable. Horizont Equistop B1 9v Battery Energiser: Specifically designed for strip grazing use with horses, with an ability to house a 9v battery inside making it simple to handle. A solar panel option is also available for this energiser. Rutland ESB15 D Cell Battery Energiser: Compact energiser for use with short fences and small paddocks. Use 2 x 1.5v D Cell batteries, it can power up to 800m of electric fencing. 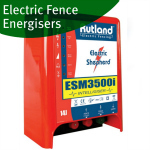 Rutland ESB25 6v Battery Energiser: Dry battery fence energisers that houses a 6v non-rechargeable battery inside. It can power up to 1,000m of electric fence, battery can be purchased in store separately. Horizont Farmer A1000 12v/9v Battery Energiser: Powerful 9v fence energiser that can also be used with 12v batteries. For longer fences and for use with stubborn animals. Has a solar panel option and an earth is included.